Small, stylish and practical - the new HTC P3470 PDA phone with built-in GPS technology delivers cutting edge mobile communication with a fully-functional satellite navigation experience. Built to be durable as well as pleasing to the eye and touch - the HTC P3470 is perfectly at home in your hand, pocket or on the dashboard of your car. 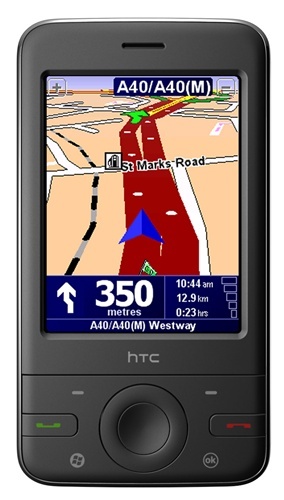 Boasting an ultra-sensitive integrated GPS chip for up-to-the-second optimised route data, the HTC P3470 keeps you one step ahead on your journey when used with TomTom NAVIGATOR™ or CoPilot® LIVE maps software. Built around the latest Windows Mobile® 6 operating system, the HTC P3470 makes sending and receiving e-mail, keeping in contact with friends and colleagues and managing Microsoft® Office documents on the move completely effortless. An impressive 2.8 inch high-resolution LCD touch-sensitive screen makes finding your way around applications simple and intuitive – while also providing a sensational internet browsing experience.